Come join us for a preview run for Kealia Quad Crusher next Sunday, April 29 lead by Rosie. The race is on May 5th and it is sold out! The run will start and finish at Dillingham Airfield parking lot. Good turnout this past Sunday! Come join us for another preview run for the upcoming Vi's Top of Tantalus 7 miler on Saturday, April 7th, at 8AM (yes, you can sleep in a bit) lead by Drew. Drew is visiting and would love to see many of our HURT Ohana. Race day is April 14th. The race is sold out and there is no waitlist, but feel free to run the preview or volunteer race day! The run will start and finish at the Puu Ualakaa Park, about 2 miles up Tantalus at 3200 Roundtop Drive, Honolulu, HI 96822. The race is conducted in the memory of our dear HURT friend, Vi Medusky-Jones who passed away from ALS. Start Time for the Preview is 8 AM Saturday at the main parking lot. Please carry at least 20 ounces of water. 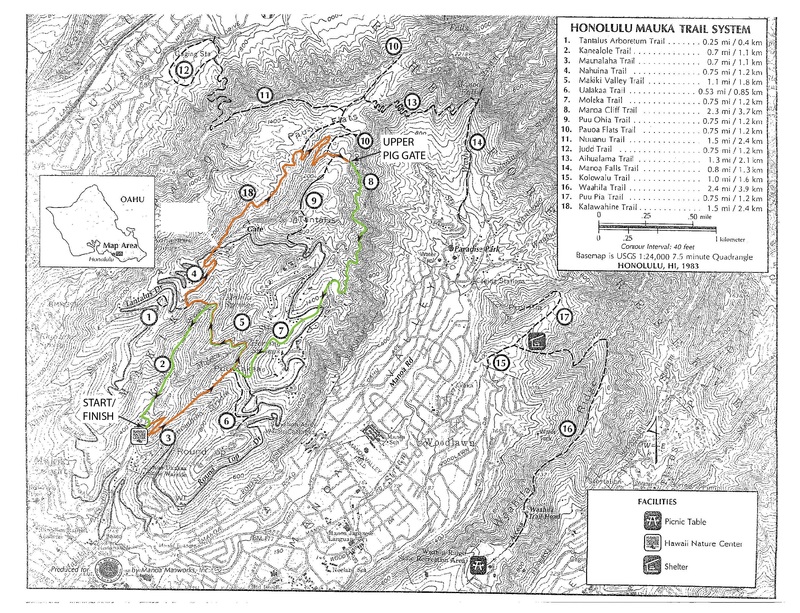 If you are not familiar with Tantalus trails, please print out the course map and carry it with you. Come join us for a preview run for the upcoming Vi's Top of Tantalus 7 miler, next Sunday, April 1st, lead by Judy. Race day is April 14th. The race is sold out and there is no waitlist, but feel free to join us for the preview or volunteer! The run will start and finish at the Puu Ualakaa Park, about 2 miles up Tantalus at 3200 Roundtop Drive, Honolulu, HI 96822. The race is conducted in the memory of our dear HURT friend, Vi Medusky-Jones who passes away from ALS. Start Time for the Preview is 7AM sharp Sunday, April 1 at the main parking lot. Care for one final preview run for Aiea Loop Express this Saturday, March 10, 2018? Meet at the lower parking lot ready to run by 7 am. Don't forget to bring some precipitation and your favorite hydration. Click here for the Google Map to Aiea Loop Trail. Please be advised that the Aiea Loop Express and Vi's Top of Tantalus races are now sold out. Also, note that these events do not have waitlists. Click here to see which races are still open. Join us again for another preview run on Saturday, March 3, 2018. Meet at the lower parking lot ready to run by 7 am. Please bring your favorite hydration. Come join us for a preview run with the pine trees on Saturday, February 24, 2018. Meet at the lower parking lot ready to run by 7 am. Congratulations again to all that ran last weekend’s Maunawili Out & Back 22-miler (aka the Run with the Pigs). Much mahalo to Marian and Neal Yasuda for putting on another great event that keeps us coming back year after year as well as adapting the race route & post-race fun! It’s now time to keep those legs going for the next-to-final race of the H.U.R.T. trail series, the Tantalus Triple Trek (3T)!! This year’s race will take place on Saturday, September 2 and will consist of three consecutive loops of the course (for a total of 30+ trail miles). If you do not know the course, please be sure to take part at least two of the training/preview runs in the next few weekends. As no pacers will be allowed, it is highly encouraged for those who are not familiar with the course to attend at least one of the sessions. To add a bit of fun and keep things interesting, we will be running the course in “reverse”. Head up the Maunalaha trail (Hogsback), across Makiki Valley trail, up Nahuina trail, and along Tantalus Drive. Continue down Kalawahine trail then along Manoa Cliff and Moleka trails, then back across Makiki Valley trail (again) and down the Kanealole (Center/Pipe) trail and back to the start/finish. Here is a map of the course. For those unfamiliar with the trails, feel free to print a copy for reference along the training run. This Saturday, 8/12, will be the first preview/training run with one full loop of the course. Please meet at the picnic and restroom area at the Maunalaha-Kanealole trail head (by the Hawaii Nature Center) at 6am. Runners are expected to bring an adequate amount of water as well as any nutrition they may require, and most of all have fun (this is not race day). If you have not yet been on the Tantalus trails, please make it a point to remain with the group, or be with someone who knows the course. Have a great remainder of the week and hope to see you on the trails! Preview run for Aiea Loop Express on Saturday, March 4, 2017. Meet at the lower parking lot ready to run by 7 am. And please bring water. Click here for more info about the trail series. Photos by RD Michael Cole. It's that time of the year again! HURT Hawaii trail series is coming up and Aiea Loop Express RD Michael would like to take out for a training spin this Saturday, February 18, over at Aiea Loop Trail. Please bring your best smile, WATER, and your spare rainbows. Meet at the lower parking lot ready to run by 7 am!! If you can't make it this Saturday, more training opportunities will come. Stay tuned to this channel and we'll do our best to get the word out as soon as possible.